Chewy, nutty couscous meets crispy spiced chickpeas in this Mediterranean Chickpea Salad. Indulge in crunchy cucumbers, bright cherry tomatoes and a tangy dressing that makes this salad perfect for any meal, with an easy meal prep option! Prepare the couscous according to package instructions and set aside. * Combine the chickpeas, olive oil, cumin, coriander, red pepper flakes, salt and pepper in a medium-sized bowl and stir gently to coat. Heat a large skillet over medium and add the chickpeas. Allow to cook until golden brown and crisp on the outside, around 10 minutes. Remove from heat. While the couscous and chickpeas cook, cut up the cucumber and tomatoes and place in a large bowl. Add the olives, red bell pepper, parsley and feta. Set aside. In a small jar with a tight lid, combine all the dressing ingredients and shake vigorously to combine. Add the couscous and chickpeas to the bowl with the veggies then drizzle with the dressing and toss gently. Adjust seasoning as desired and serve immediately. 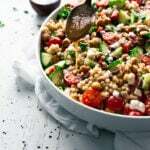 *If you are using plain couscous vs a seasoned box variety, I recommend whipping up the dressing earlier and adding a couple tablespoons to the couscous to marinate for a few minutes.